This is the first restaurant opened by 2011 MasterChef champion Tim Anderson and … it is in Brixton. 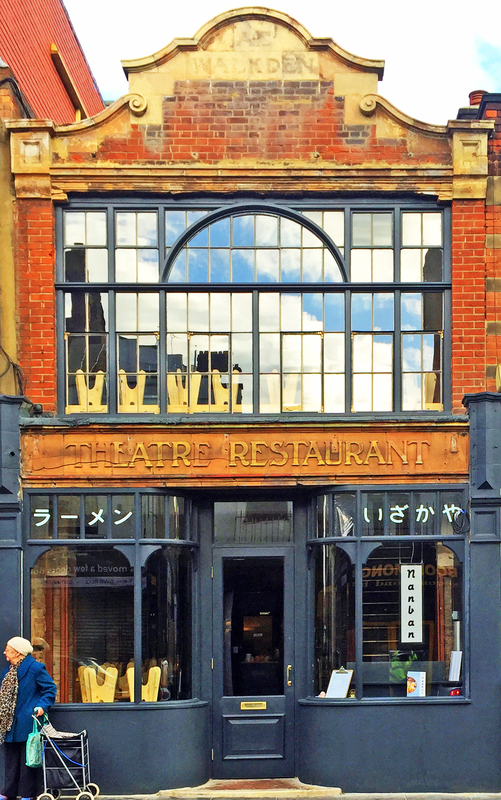 This is in the revamped Gyoza (RIP – many an enjoyable evening spent there!) restaurant after some large changes to the décor but keeping some nostalgia from a building that used to be the eel and pie shop. There are regular tables and some “carriages” for lots of people to sit together. There are also long cork low bench-like tables which are OK for two people but any more and you get a crick in your neck as it’s like playing tennis. There was a bit of space when we arrived on a Monday evening but by the time we left it was full and really humming. The long menu is on their website so we won’t repeat it here but just to say that there are certainly adaptations to Brixton cuisine and we couldn’t find much like the menu we enjoyed when Tim visited Market House last summer – see our review here. 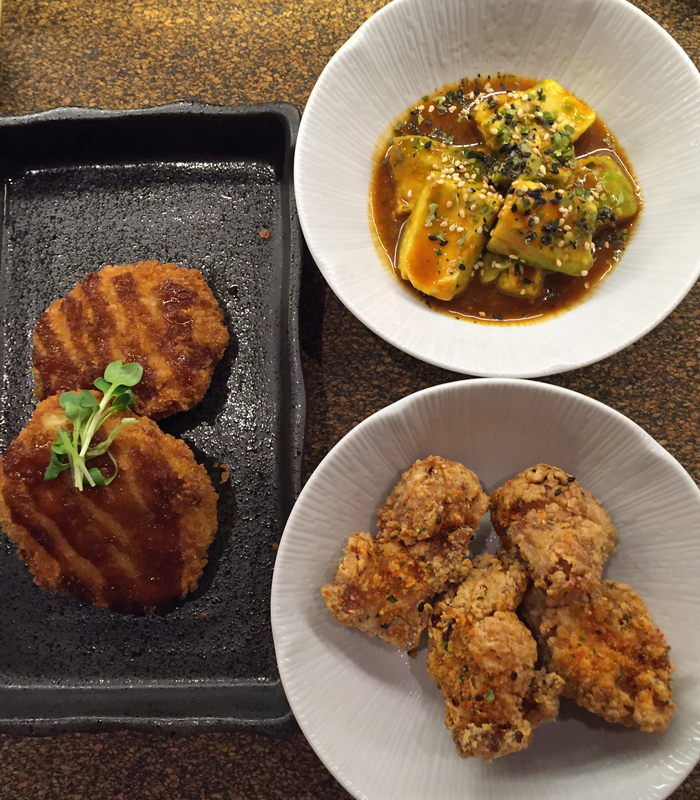 You choose from small plates and big plates. We decided to wait for another trip to try the twice cooked pig tripe, and anyway, we thought our choices daring enough. There were three of us so one of us chose three small plates: the Ackee and Saltfish Korokke (Potato, ackee, and saltfish croquettes with katsu sauce), Brixton Market Salad (“Whatever looks good in Brixton Market”, which turned out to be avocado with a Japanese dressing) and Chicken Karaage (Deep-fried marinated chicken thighs). All three were fantastic. The chicken was succulent and had the perfect amount of chilli. We couldn’t taste the ackee so much in the croquettes but the saltfish definitely made an impact. 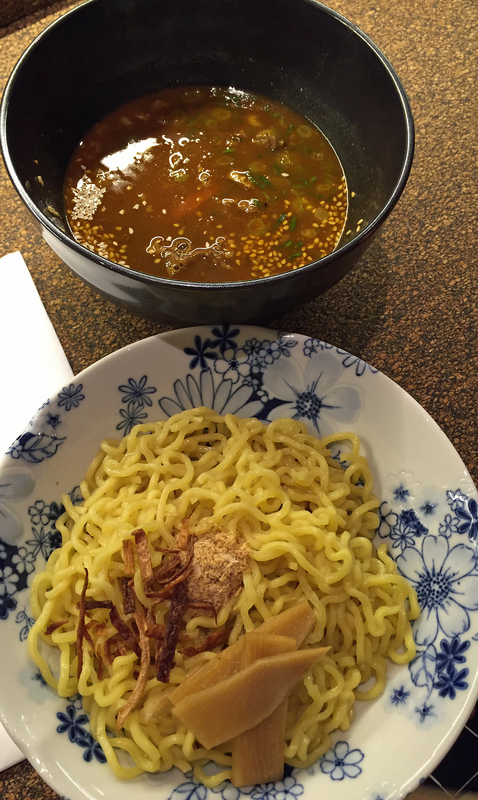 We also went for a big plate of Curry Goat Tsukemen (Curry goat dipping ramen with ½ tea-pickled egg, seafood sawdust, and Scotch bonnet-pickled bamboo shoots). I was warned about the pickled bamboo and was very glad I was. My tentative first bite turned my mouth on fire and I carefully shifted them to the side of the plate – too much of an adventure for me and I hadn’t brought enough tissues. The goat was succulent, with little bone and not to much fat. A really great dish with more to it than West indian curry goat – if only the cardamom pods. It had a real depth of flavour and I would definitely order it again. 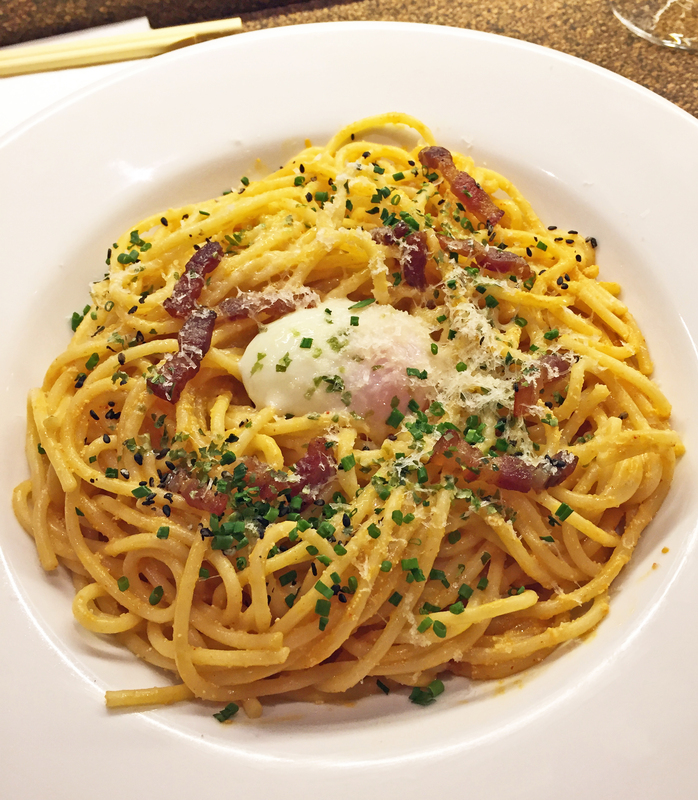 The last guest ordered Mentaiko Pasta (Spaghetti in chilli-cured cod roe sauce with onsen egg, Parmesan, pancetta, aonori, and black pepper). This was a bit like a spaghetti carbonara but with extra umami from the cod roe – unexpected but excellent..
We washed this down with tap water, a Camden Lager and a glass of Sanglier white wine. This is one to add to our list of where to eat on Mondays. The bill came to £44.15 including service and the drinks.